This Irish coffee mug is enhanced with a classic blessing along with shamrocks. This Irish coffee mug features a traditional blessing with shamrocks on both sides. 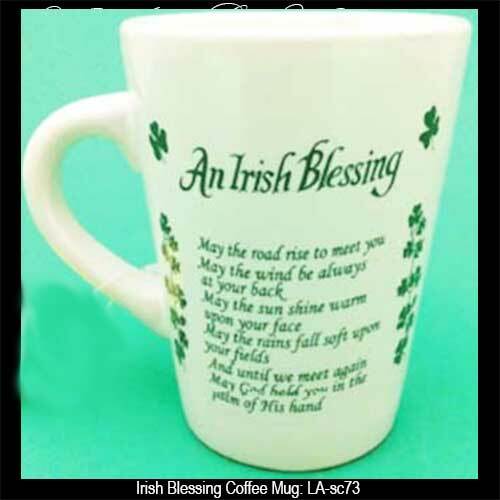 The Irish blessing coffee mug holds 8 ounces of your favorite beverage and it stands 4" tall. The ceramic Irish coffee cup is dishwasher and microwave oven safe. The Irish blessing coffee cup is made in Ireland by Liffey Artefacts and it is gift boxed with a shamrock history card that is complements of The Irish Gift House.